By David Edwards—So this is what happens when two old surf dudes get together. Richard Pollock, our favorite street-tracker builder, was a semi-pro surfer in his youth. 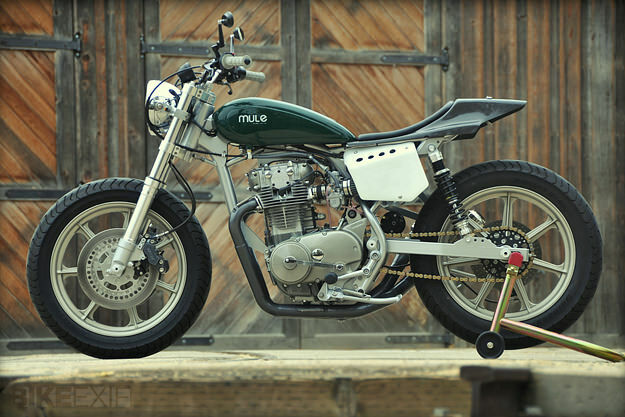 Motocross was a way to pass time when the waves were flat, which led to a gig as a bike shop mechanic, which led to a 30-year career as an aerospace fabricator, which then led back to motorcycles, specifically Mule Motorcycles. To date, about 140 machines, almost all street-trackers, have left the refitted suburban San Diego two-car garage that serves as Mule’s build facility.